All of the major characters in the Harry Potter universe have changed throughout the seven, soon-to-be-eight films-- that's kind of inevitably when you're shooting films over the course of 10 years and watching child actors grow into full-fledged adults. But Tom Felton, cast as the sneering and pompous Draco Malfoy when he was just 12, may have gotten to make the most interesting transition. Malfoy is never going to be one of Harry Potter's best friends, but in the last few films he's gone from being a total villain to a sympathetic victim of Voldemort's cruel reign; fans of the book know that in the second half of the seventh book, which will make up the entirety of this summer's Harry Potter and the Deathly Hallows: Part 2, Malfoy makes some decisions that proves he's probably been a much better person all along than Harry ever expected. And though he's not quite the same hero of the film that Harry, Ron and Hermione are, Malfoy is getting his own character poster anyway, debuted today by Warner Bros. As ever with Malfoy, it's hard to get a read on what he's thinking here-- about to make the decision to go do something heroic, or mentally cursing out Harry in his mind like he always has? He looks less blatantly evil than Voldemort did in his poster, but not quite as casually heroic as Neville. 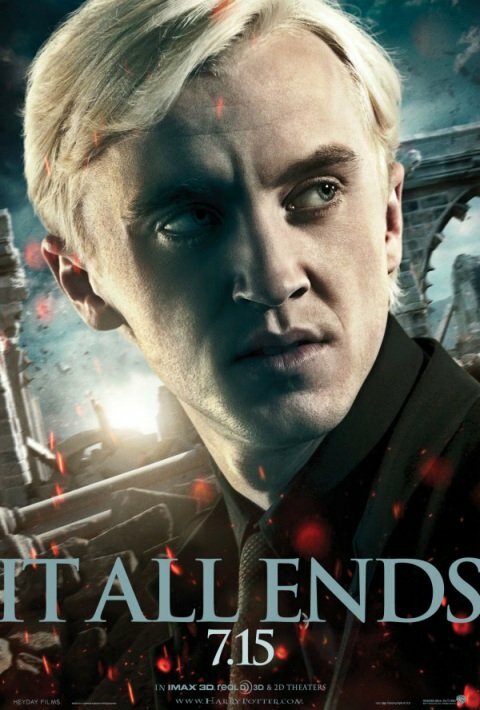 You can see the full series of posters in our Blend Film Database once you check out Malfoy below, and of course, see the film in theaters on July 15 this summer.